Victoria is a year-round destination for out-of-town guests, be it over the Christmas holidays or during our region’s glorious spring and summer months. The potential for an influx of houseguests is something interior designer Ben Brannan, principal designer at Bespoke Design, makes sure his clients are aware of, especially if they are new to the city. If you’ve ever been banished to a lumpy pullout hidden behind a cluttered desk in a dark corner of the basement, you’ll appreciate that there is an art to creating a welcoming space for guests. Brannan would agree. Besides striving for continuity, he says everything you choose for your guest room should be in keeping with your personal style. You want flow throughout your home. That said, you can take a few liberties. With the dedicated guest room, Fisher advises figuring out who is typically going to be staying there, how often and for how long. This will play into the configurations for beds. For instance, sometimes two twin beds are put together to make a king — then you have options depending on whether it’s a couple or children staying in the room. Brannan points to some clients who recently became grandmothers. “They not only created guest rooms, but put in an adjoining nursery off the guest room, for when their families visit with the grandbabies,” he says. When space is at a premium, the best way to incorporate a guest room is to have it serve a dual purpose, so you are able to make good use of the space when you don’t have visitors. Brannan has clients who use guest rooms to store out-of-season clothing and décor, and for gift-wrapping stations. To truly make a room multi-functional, Fisher recommends a wall bed. Do allow yourself to think outside of the norm when considering how to accommodate guests. There are plenty of areas that could be converted into a pleasant spot for an overnight stay. “A laundry or utility room of an adequate size could facilitate a rollout bed making a fun space for young guests like grandchildren,” suggests Fisher. Wall beds can range in size from twin to queen and can serve multiple uses. 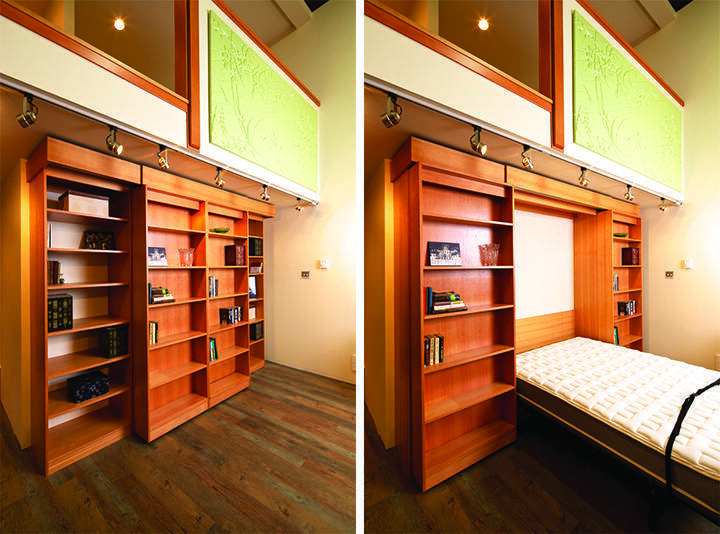 This Book Shelf bed from Island Murphy Beds has plenty of functional space. Whether your guest space is a private ensuite or a room that must do double-duty, such as a sewing room, Fisher advises that you treat it like a hotel room to make your guests’ stays as pleasant as possible. Brannan says the bare necessities for any guest area include a comfortable mattress and pillows, as well as the nicest sheets you can possibly provide, so the actual sleeping part is restful for your guests. Even in the smallest spaces, a pullout bed or daybed can provide a cozy spot to sleep. Just make sure to get the most comfortable and supportive pullout you can afford. Advances such as memory foam, trampoline-like bases and coil suspension mattresses mean guests won’t wake with an ache in their lower backs. 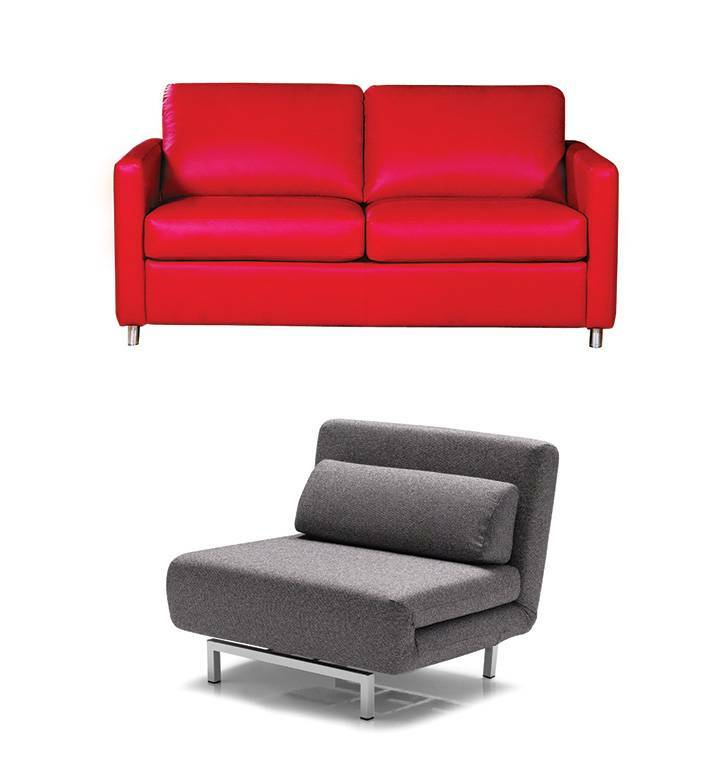 Adelman says that the new models are more space efficient, and even king-sized options come in apartment-sized sofas. Once you have the basic necessity of where guests will sleep covered, you can add little creature comforts that make the space even more inviting. “Fresh flowers in the room let them know you are really excited about them coming to your home, that it’s an event,” Brannan says. Consider adding a basket of toiletries from local favourites such as Silk Road, Sapphire Day Spa, Nezza Naturals or Two Blooms. Of course, creating a haven of comfort and respite for your out-of-town guests comes with a warning: they may never leave. “We always joke with clients about making their guest space comfortable, but not too comfortable that they overstay their welcome,” Fisher says. That’s a risk worth taking. You may be hosting your guests in a co-opted corner of your home office or a private bedroom worthy of a luxury hotel; either way, by adding thoughtful details and creature comforts, your guests will truly appreciate your hospitality — and who knows, maybe someday they’ll want to return the favour.